Chapter I. How is Vocabulary learned? Vocabulary is not a syllabus, i.e., a list of words that teachers prepare for their learners to memorize and learn by heart. Memorizing may be good and useful as a temporary technique for tests, but not for learning a foreign language. Language students need to learn vocabulary of the target language in another way. If we are really to teach students what words mean and how they are used, we need to show them being used together in context. Words do not just exist on their own; they live together and they depend upon each other. Therefore, teaching vocabulary correctly is a very important element in language learning. Correct vocabulary instruction involves vocabulary selection, word knowledge and techniques. In the past, teachers used to select and present vocabulary from concrete to abstract. Words like 'door', 'window', 'desk', etc., which are concrete, used to be taught at beginning levels. However, words like 'honesty', 'beauty' etc., which are abstract words, used to be taught at advanced levels because they are not "physically represented" in the learning/teaching environment and are very difficult to explain. Nowadays methodologists and linguists suggest that teachers can decide and select the words to be taught on the basis of how frequently they are used by speakers of the language. That is, the most commonly used words should be taught first (Harmer). We can get information about which words will be most useful for learners of English by looking at frequency counts of vocabulary. Usually a vocabulary count is done by making a list of the words in a particular text or group of texts and counting how often and where they occur. Some of the more recent counts have used computers to list the words and count their frequency (Nation). Besides that, teachers can decide which words are useful and should be taught to their learners on the basis of semantics. This means, that the word is more useful if it covers more things than if it only has one very specific meaning. For example, the word 'book', which is taught at beginning levels, has wider usage than the words 'notebook', 'textbook', etc. Furthermore, Nation says that frequency and coverage are not enough to be used when teachers select and prepare a word list for learners of English. So he suggests other criteria, such as language needs, availability and familiarity, regularity and ease of learning or learning burden. Teachers can help their learners enrich and increase their vocabulary. They can also help the learners to build a new store of words to select from when they want to express themselves. If any learner can handle grammar correctly, that does not mean that he can express himself fluently unless he has a store of words to select from. Therefore, teachers are a very important factor in selecting and teaching English vocabulary, and they have to design vocabulary syllabi according to their learners' needs. As a result, “teachers vocabulary work can be directed toward useful words and can give learners practice in useful skills". The selection of words which are to be taught to the students is a very important procedure in the language learning process. However, the word selection process doesn't mean that the students will be fluent in expressing themselves in English upon learning that list, i.e., what students need to know regarding vocabulary is the word meaning, the word use, the word formation and the word grammar. When conveying the meaning to the students, teachers should teach their students that a word may have more than one meaning when used in meaning, different contexts. For example, the word "book" has at least twelve different meanings when used in context. It has eight meanings as a noun, two meanings as a verb and three different meanings when used with prepositions as phrasal verbs. One may say "I booked my ticket three days ago"; another "I booked him for speeding" and so on (Harmer).Teachers should make the teaching learning vocabulary process clear and easy for their students when conveying any meaning; otherwise the student may feel bored and become fed up with learning vocabulary. The meaning of words can be communicated in many different ways. Nation suggests that teachers can convey meaning to their students by demonstration or pictures (using an object, using a cut out figure, using gesture, performing and action, photographs, blackboard drawings or diagrams and pictures from books) and by verbal explanation (analytical definition, putting the new word in a defining context, and translating into another language). Besides that, teachers should involve their students in discovering the words' meanings by themselves and let them make efforts to understand words' meanings. When the students are involved in discovering meaning, they will never forget those meanings and they will be able to express themselves fluently. When a single word has various meanings, the teacher should decide which meanings are to be taught first, i.e., the teacher must decide which meanings occur most frequently and which meanings the learners need most. As a result, the students will be motivated, and gradually they will build their own store of words which will be a basis for communication at any time. Teaching vocabulary is not just conveying the meaning to the students and asking them to learn those words by heart. If teachers believe that the words are worth explaining and learning, then it is important that they should do this efficiently. Teachers should use different techniques and activities in teaching English vocabulary to motivate the learners, enrich their vocabulary and enable them to speak English properly. We looked at possible sources of vocabulary input, including vocabulary books, readers, dictionaries and corpora. A motivated and self-directed learner might be able to acquire a large vocabulary simply by using these resources. However, many learners sign up for language courses in the expectation that, at least some of the time, they will be presented with language, rather than having to go out and find it for themselves. By presentation, we mean those pre-planned lesson stages in which learners are taught pre-selected vocabulary items. Of course, incidental vocabulary teaching can occur at other times of the lesson, as when a text or a discussion throws up unfamiliar vocabulary. In this chapter, however, we will be mainly concerned with ways vocabulary can be formally presented in the classroom. But many of the issues are relevant to the informal teaching of vocabulary as well. At the very least learners need to learn both the meaning and the form of a new word. We shall deal with each of these components in turn. But it's worth pointing out that both these aspects of a word should be presented in close conjunction in order to ensure a tight meaning-and-form fit. The greater the gap between the presentation of a word's form and its meaning, the less likely that the learner will make a mental connection between the two. - the difficulty of the items - whether, for example, they express abstract meanings. The usual procedure is as follows. (c) those represented by pictures, such as those printed on picture cards or wall charts, or by rough drawings on the blackboard. Visual aids take many forms: flashcards (published and home-made), wall charts, transparencies projected on to the board or wall using the overhead projector, and board drawings. Many teachers collect their own sets of flashcards from magazines, calendars, etc. Especially useful are pictures of items belonging to the following sets: food and drink, clothing, house interiors and furniture, landscapes/exteriors, forms of transport plus a wide selection of pictures of people, sub-divided into sets such as jobs, nationalities, sports, activities, and appearance (tall, strong, sad, healthy, old, etc). - giving a full definition. All of the above procedures can be used in conjunction, and also in combination with visual means such as board drawings or mime. Although a verbal explanation may take a little longer than using translation, or visuals or mime, the advantages are that the learners are getting extra “free” listening practice, and, by being made to work a little harder to get to the meaning of a word, they may, be more cognitively engaged. The more of these task types that can be performed on a set of words the better. In other words, an identification task could be followed by a matching task, which in turn could be followed by a ranking task. Identifying words simply means finding them where they may otherwise be “hidden”, such as in texts. • Count the number of times plane(s) and train(s) occur in the text. • Find four words connected with, flying in the text. • Find five phrasal verbs in the text. • Find eight comparative adjectives in the text. • Underline all the words ending in -ing in the text. 1 What are these clothes in English? The answers are all in the word square. Selecting tasks are cognitively more complex than identification tasks, since they involve both recognising words and making choices amongst them. 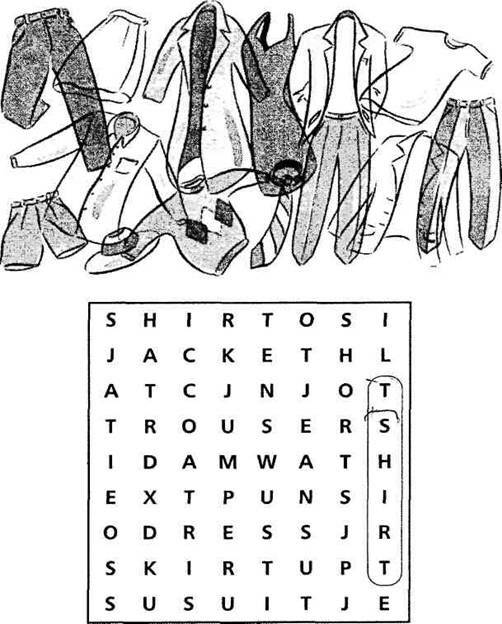 This may take the form of choosing the “odd one out”, as in this task (again, based on the lexical set of clothes).